To offer customers the experience they expect requires more than traditional analytics. You need digital intelligence. As we’ve evolved into a true Digital Intelligence Platform, we’re in the right position to help you offer amazing customer experiences across channels. 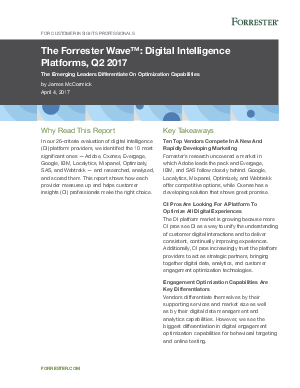 See why we are listed as the only Leader in The Forrester Wave™: Digital Intelligence Platforms, Q2 2017.